Hurricanes Harvey and Irma are powerful reminders of the devastation that disaster brings. The storms in Texas and Florida left behind billions of dollars of damage and displaced thousands of residents. But disasters have had a profound human silver lining. They have brought people together—again—to help people whose lives have been ripped apart. “After Hurricane Katrina knocked several New Orleans credit unions offline and displaced many members to other cities, it was discovered that shared branching was a de facto disaster recovery option for credit unions and their members,” says Dave Klavitter, chief marketing officer at Dupaco Community Credit Union. The CO-OP Shared BranchSM network offers fee-free access to your money at more than 5,000 participating credit union branches nationwide. You need only to identify your credit union, provide your account number and show photo identification. 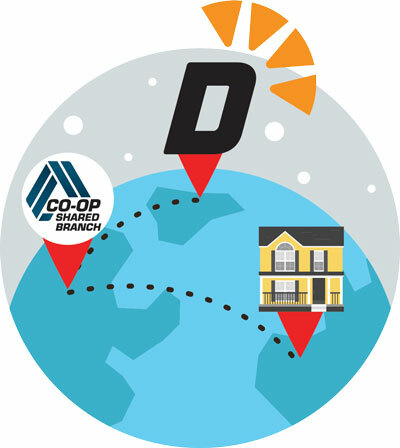 Dupaco’s mobile app can point you to your nearest shared branch. As National Preparedness Month points out, emergencies can happen at any time. And while disasters don’t plan ahead, you can. Shared branching is one more resource available when disaster strikes.